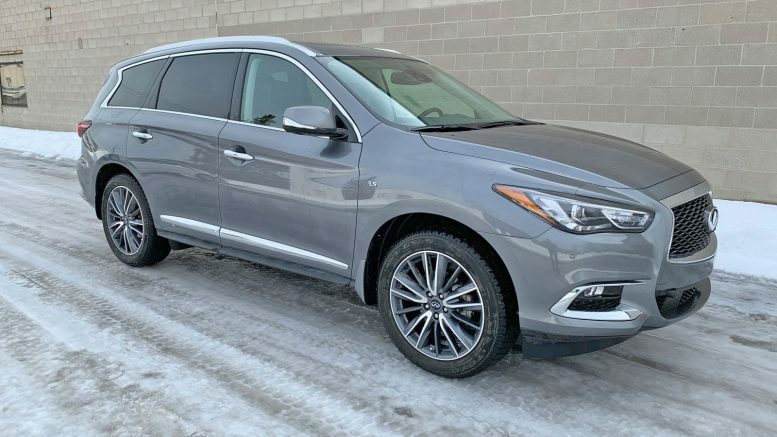 The Infiniti QX60 is a mid-size, three-row SUV capable of seating up to seven people so it’s perfect for large families. It’s precisely that fact which got me excited to try it out for a week because my every-growing family needs space – and a lot of it. 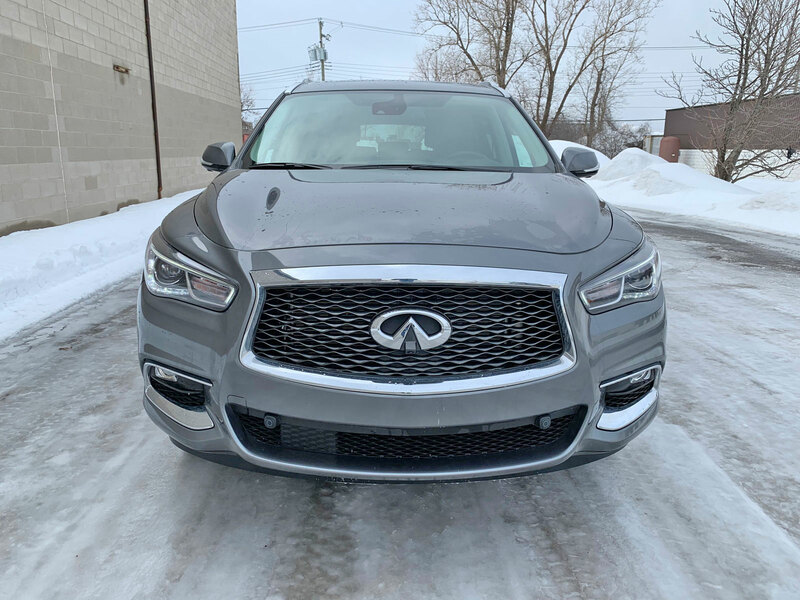 You may recall that the vehicle was previously named the Infiniti JX35 when it was launched in 2014 but that moniker lasted for only that year because of the brand’s new naming scheme of having QX## for SUVs and Q## for cars. 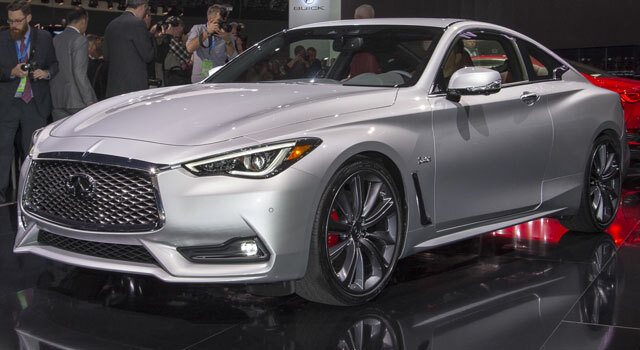 New for 2019 is a bunch of safety features including blind spot monitoring, forward emergency braking and front collision warning. The test vehicle came equipped with the ProASSIST package which offers parking sonar, lane departure warning, adaptive cruise control and automatic high beams (I really detest automatic high beams). 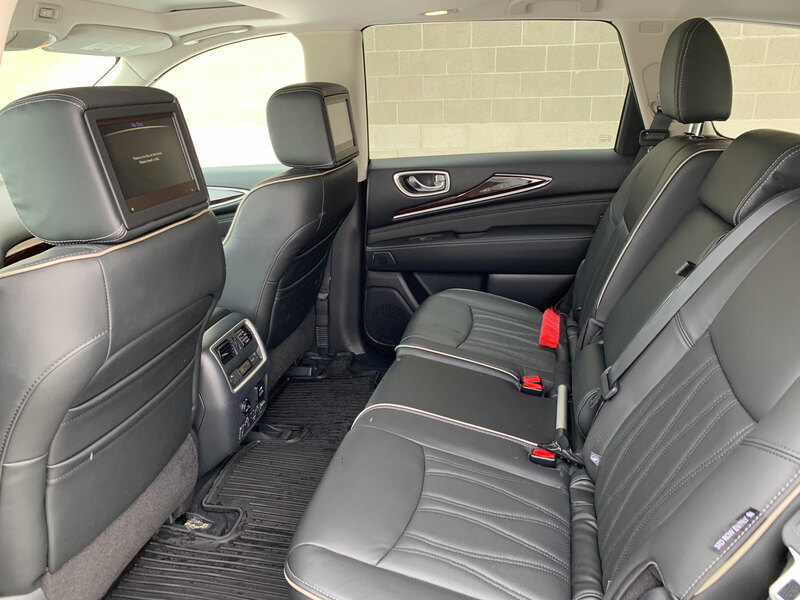 Believe it or not, the first thing that I look at when I consider a family vehicle is whether there is a rear-seat entertainment system. 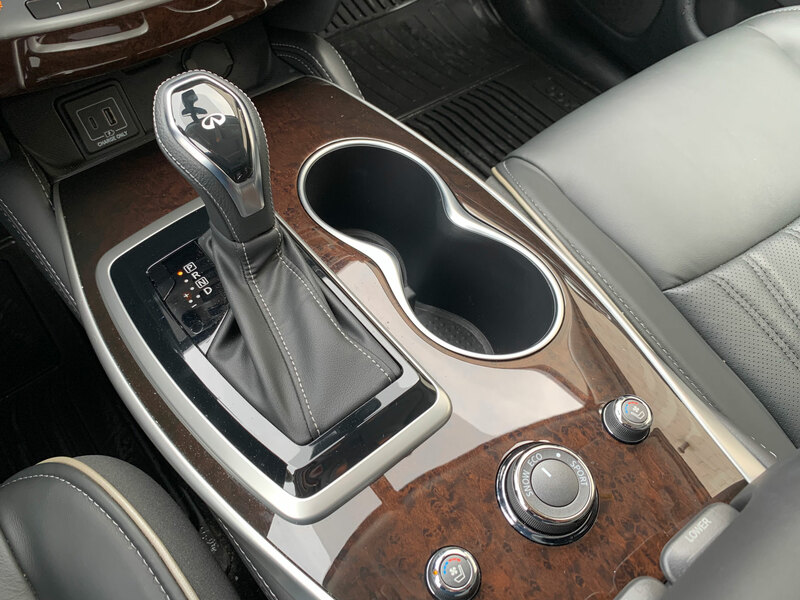 Many manufacturers have shied away from offering any sort of DVD player or screen for the rear passengers because their studies have told them that since kids all have tablets these days, it’s simply not necessary. I beg to differ. I *need* screens for the rear occupants and yes, my kids have tablets, games, phones and whatever else. They do the job sometimes but nothing keeps them quiet like watching a movie in the car. 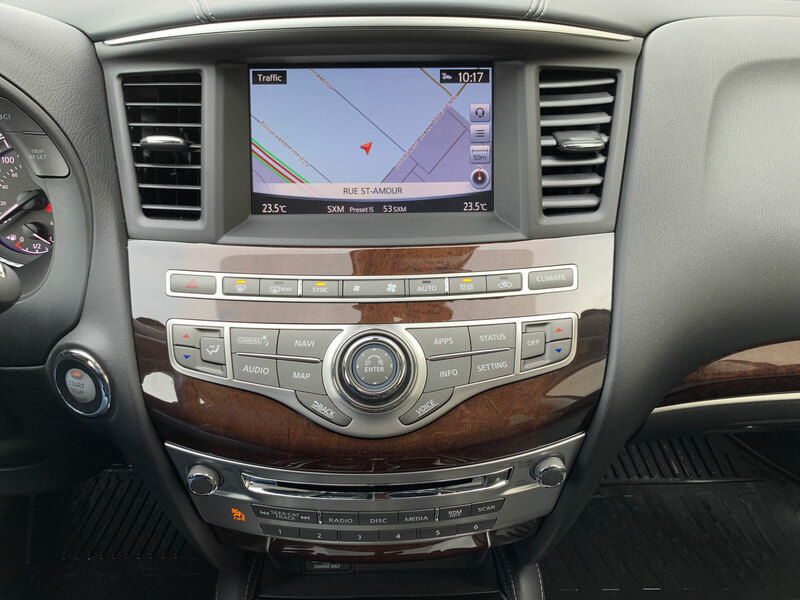 The QX60 has an excellent system with two screens mounted flush inside the front headrests. Operation is easy and is handled from the front (you’d think this would be a no-brainer but I’ve tested vehicles that were so poorly conceived that they could only be operated by the children in the rear). The entire system was excellent if a bit visually outdated. As you can see from the photos, the interior is also getting on in years and could use an update. 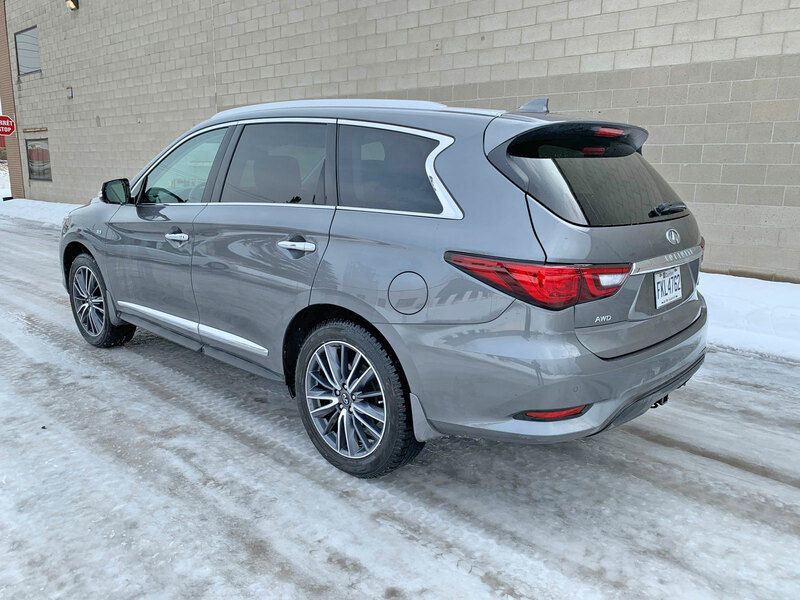 The new QX60 won’t likely be released for the 2020 model year which is a bit of a disappointment but we get what we get. 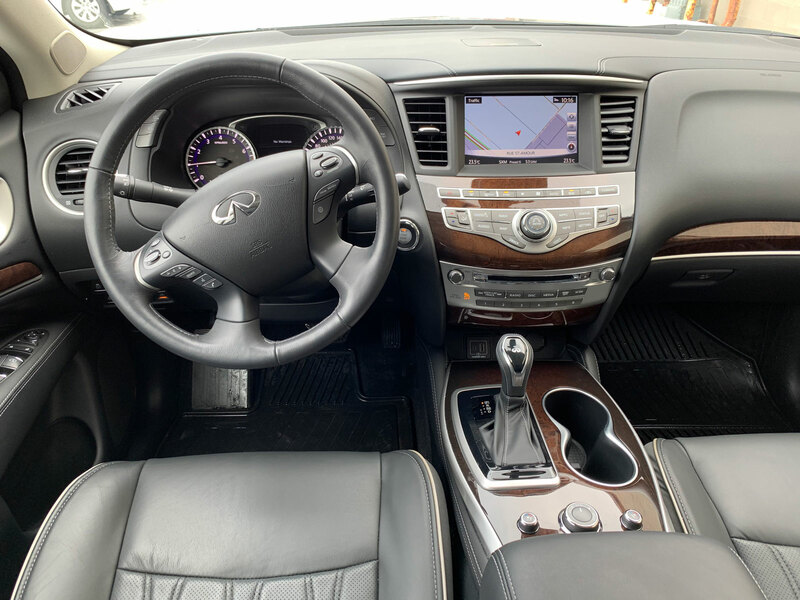 If it’s anything like the new Q50 it’ll be worth waiting for because I just tested one and the interior was spectacular. 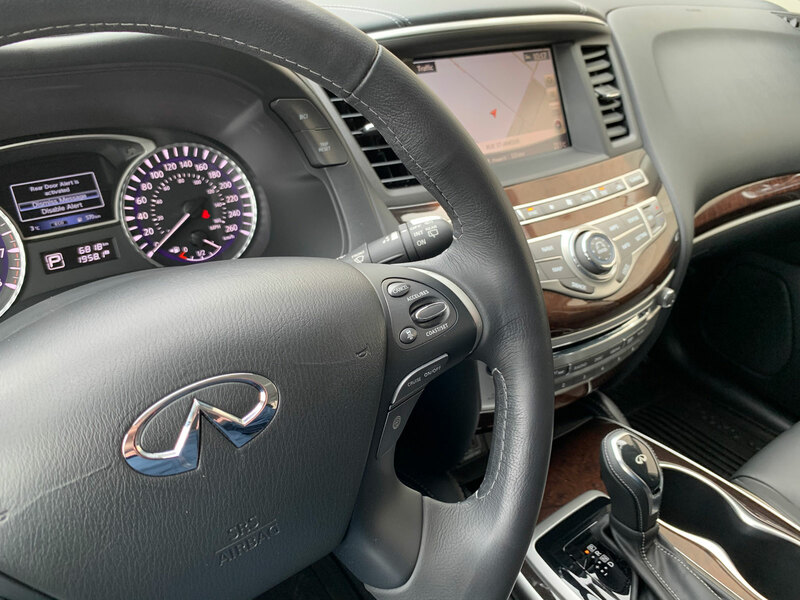 All that being said, the current QX60 remains comfortable and easy to operate. The buttons are sufficiently large to see and press, as is the screen. As mentioned before, the DVD player is up front and the driver can easily start playback for the little ones in the rear. 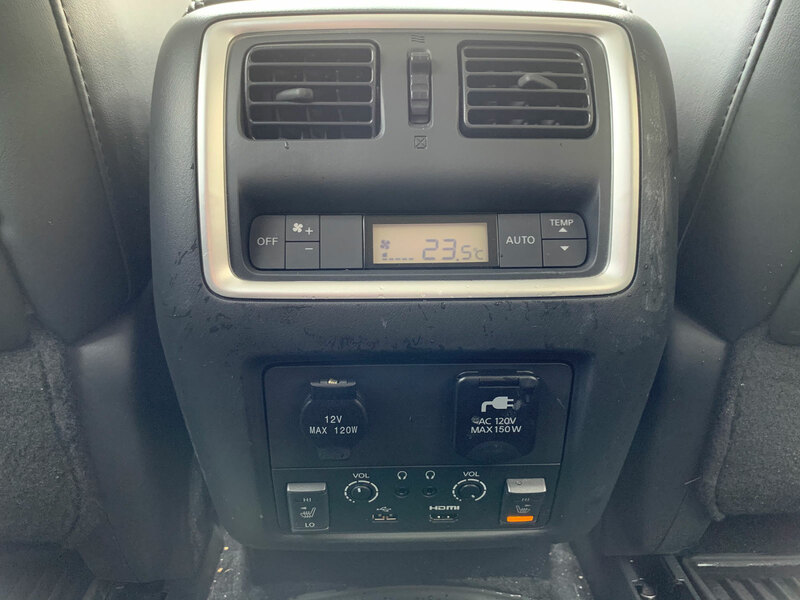 Apple CarPlay and Android Auto unfortunately remain unavailable in this vehicle. 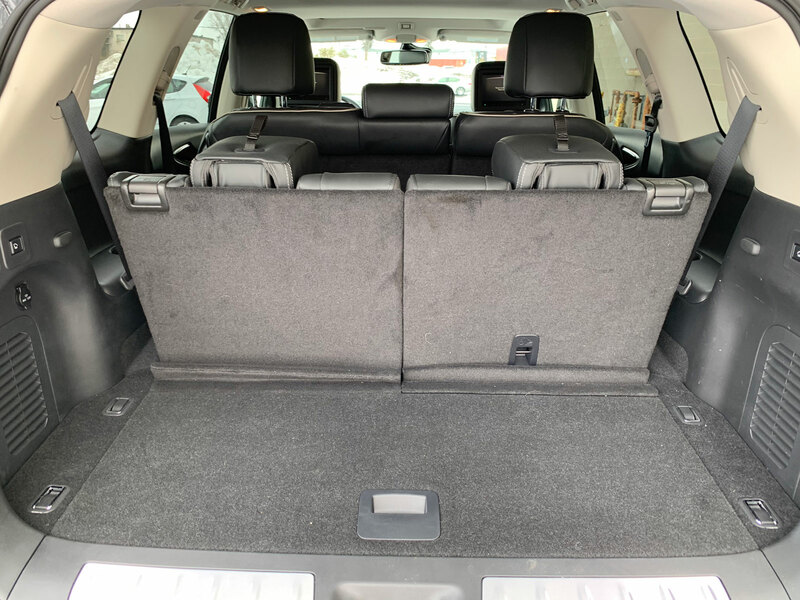 Even though technically this is a “mid-size” SUV it’s a big, bloating truck that will push the limits of supermarket parking spaces in suburban North America. 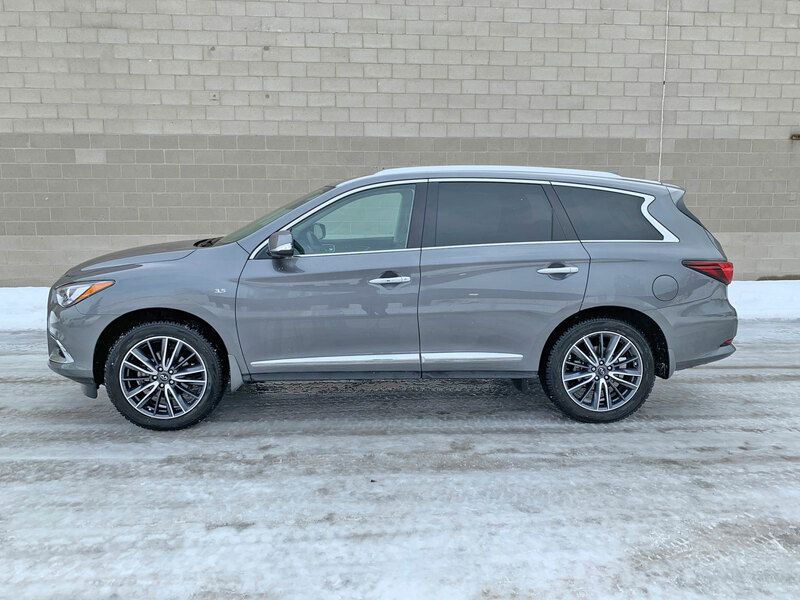 At 196.4 inches it’s longer than the Acura MDX by three inches and the Lexus RX by four inches although surprisingly it’s smaller than the Pathfinder by about an inch. For comparison, a full-size SUV like the QX80 is about ten inches longer. 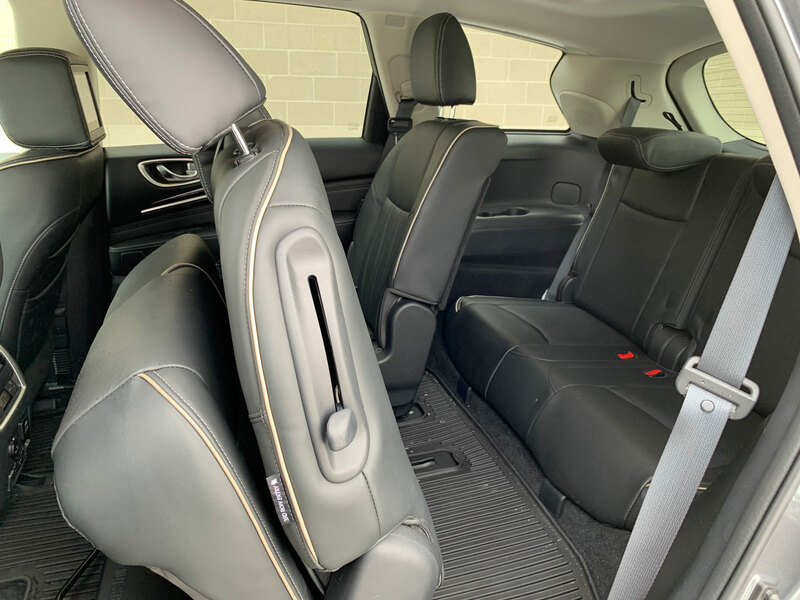 The three-row configuration makes it ideal for families whose kids have graduated to the booster phase. The middle row can even be folded forward to access the third row without removing a child seat. 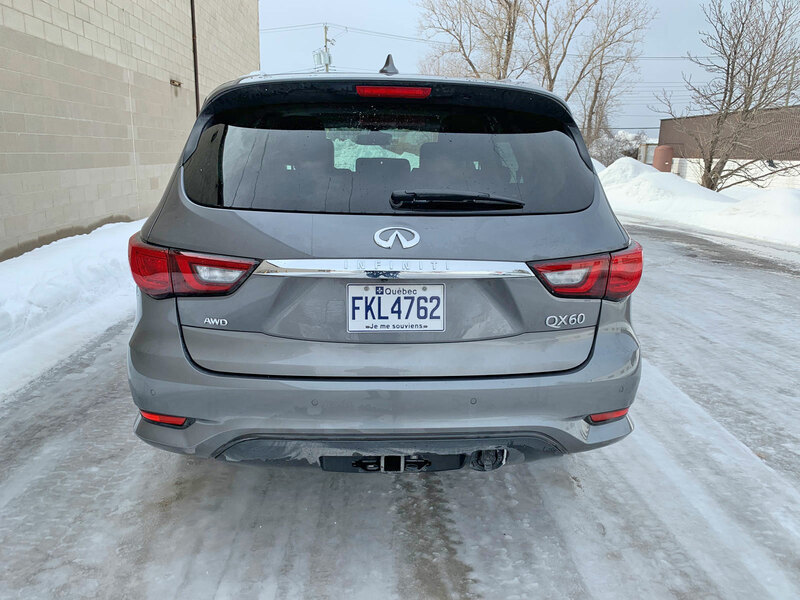 While the QX60 is the upscale equivalent to the Nissan Pathfinder which also has three rows, the Infiniti has a slight deficit in cargo volume and passenger space. 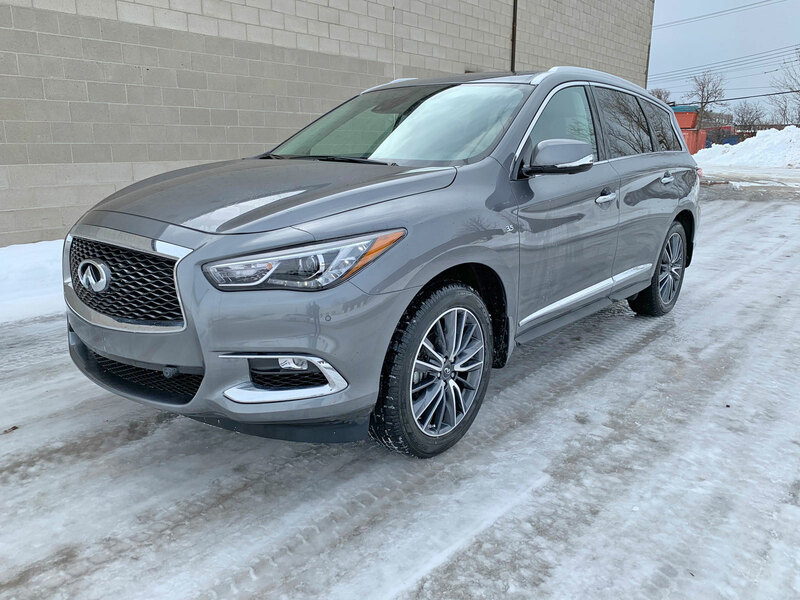 Powering the QX60 is a 3.5-liter V6 engine that churns out 295 horsepower and 270 pound-feet of torque. The SUV drives quite well in daily driving situations but it’s size and weight are apparent. The engine is a little noisy but manages to get the job done is a relatively smooth manner. The transmission is continually variable which doesn’t deliver optimal performance but keeps the drive smooth above all else. Fuel economy was an average 14 L/100km in heavy city driving the week that I had it. 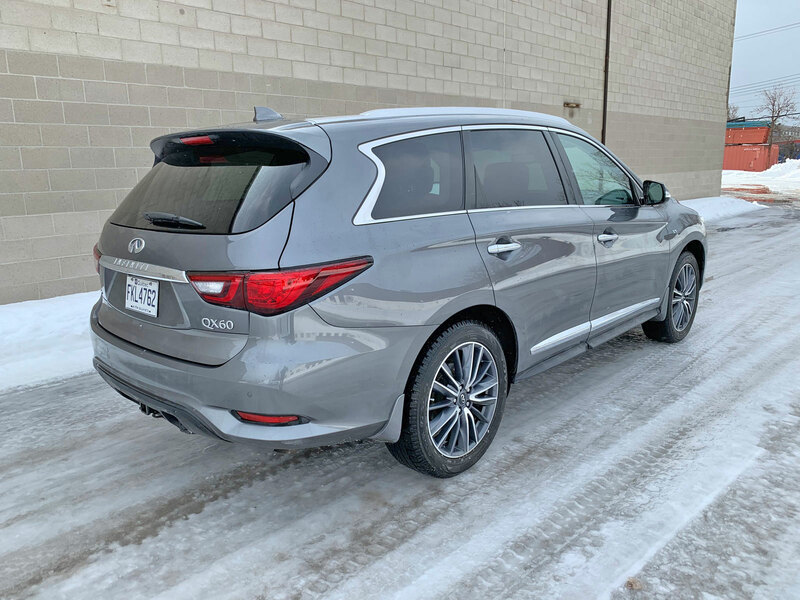 In Canada, all QX60 models come standard with all-wheel drive. 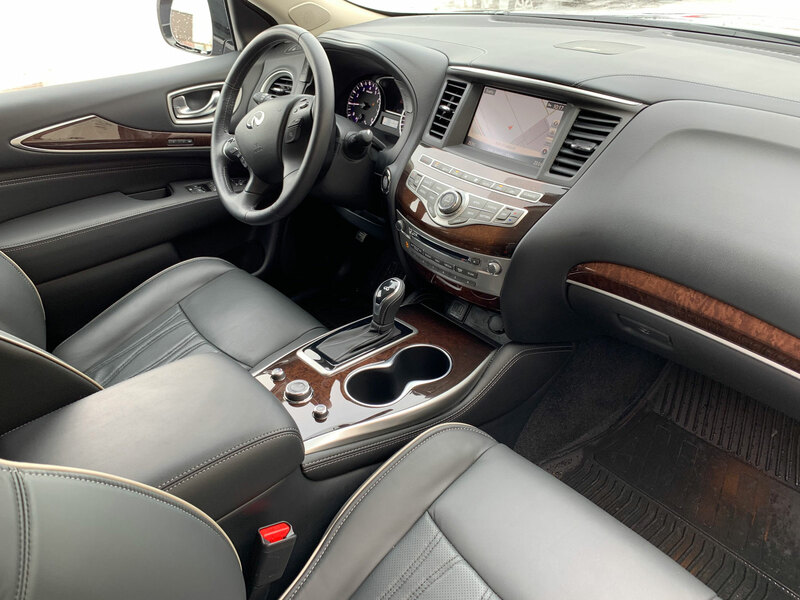 Starting at $48,695, the QX60 remains a viable option for those looking to haul their families in luxury and style. 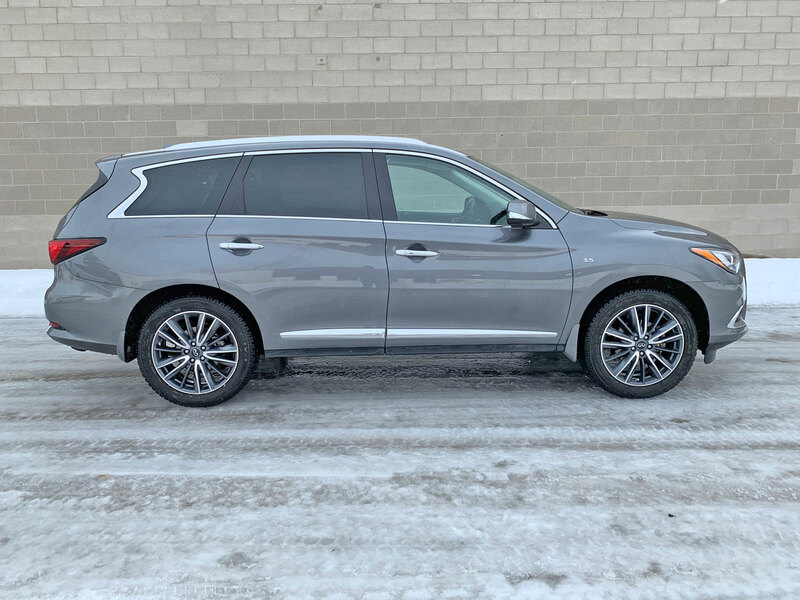 It’s a great alternative for people who why away from the stigma of driving a minivan or who need the added functionality of all-wheel drive for our harsh winters.